Blood in the urine (hematuria) occurs in 10% of children on occasion. It may be microscopic, detected only with a dipstick or high magnification. It may be gross, with urine that looks like cola, red wine, or cherry Kool Aid. Sometimes kids have microscopic hematuria with intermittent episodes of gross blood. These children often have IgA nephropathy (IgAN). Many patients with IgAN suffer no symptoms and diagnosis requires kidney biopsy, so the exact incidence remains unknown. In the US, about 0.5 new cases per 100,000 children occur annually. In Japan, the incidence is 10-fold higher. No one knows the cause of IgAN, but we assume that the immune system lies at fault. The diagnosis currently relies on the presence of IgA deposits in the glomeruli, the filtering units of the kidneys. 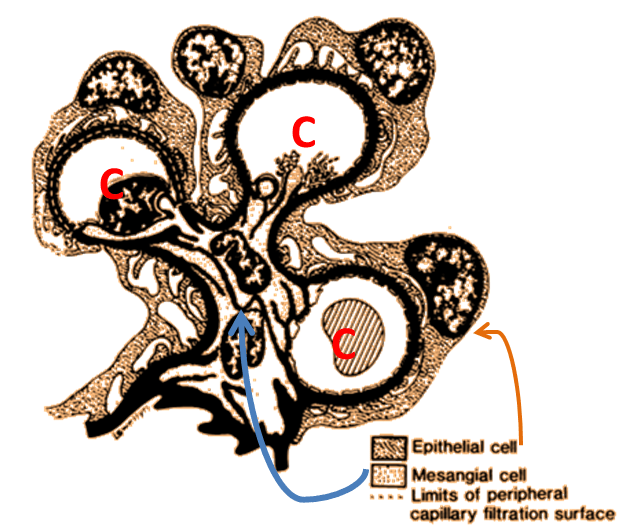 A portion of a glomerulus (a tuft) is shown in the diagram. Blood flows through and gets filtered in the capillaries (red C’s). Epithelial cells surround the capillaries (orange arrow), while mesangial cells (blue arrow) fill the “stalk” region of the tuft. Using special techniques we can see IgA in the mesangial region of the glomerulus in this disorder. There may also be extra cells in that area, known as mesangial proliferation. 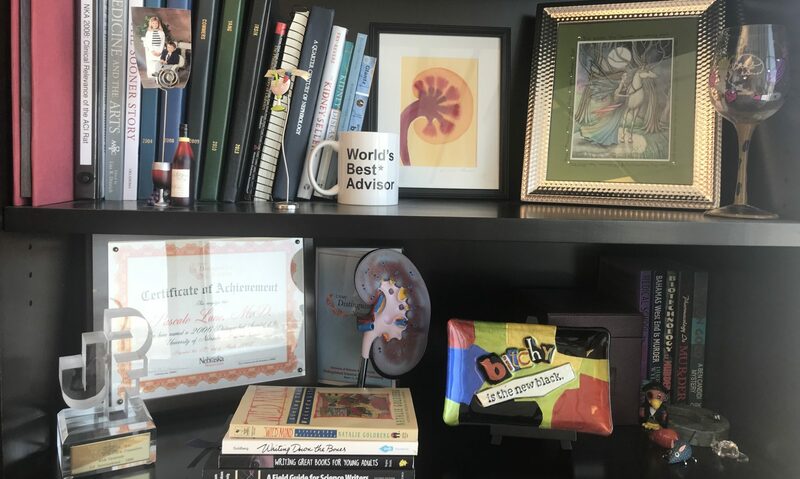 Nephrologists reserve biopsy, an invasive procedure, for children with abnormalities of at least one of these measures of kidney function, or children with multiple episodes of gross hematuria. Usually patients need no treatment if all measures of kidney function are normal, other than annual observation. Elevated BP requires treatment, usually with anti-angiotensin therapy (ACEIs or ARBs, in doctor-speak). These agents benefit the kidney beyond their ability to lower BP, especially with elevated P:C ratio. If the P:C is more than 1 mg/mg, then anti-angiotensin drugs should be given even if the BP is normal! After 6 months of therapy, if the P:C remains more than 1, then a 6-month course of steroids should be discussed. Fish oil may also be considered with persistent protein in the urine. When the eGFR falls rapidly, often associated with crescents (a type of glomerular scar where epithelial cells multiply) on the biopsy, aggressive therapy with steroids and strong immunosuppressants (cyclophosphamide or azathioprine) may reverse the disorder. A number of other drugs can be used in IgAN, but none have proven benefit at this time. The prognosis of IgAN depends on P:C, BP, and findings on the biopsy at diagnosis. If no high-risk abnormalities are present for these 3 factors, the 20-year survival without dialysis for both children and adults was 96%. If P:C>1, BP>95th percentile, and unfavorable biopsy findings were present, only 36% of patients maintained kidney function for 20 years.